But these are the other options I considered! I'm excited to get the ones I just ordered, and hopefully I can add these ones to my collection! Do you own any plugs from Omerica Organic? Where is your favorite place to buy plugs? The button ones are too cute! Also love the ones you have! new customers can use the code 'kaelahbe' for 20% off :P (or you can just use a new email addy and pretend to be new haha) i love the ones you got. i love #3, too. and #4. i really should buy some! bloodwood (like #4) is my favorite wood for plugs. I gauged my ears when I was 18 but took them out before I turned 20 and they shrunk back to normal. Sometimes I miss them, other times I'm glad I don't have them anymore. These plugs definitely make me want to gauge my ears again! I almost got the button ones the other day. It was between those and the keyhole ones. But instead I found a cute lace pair on BMA modified instead for like 18 bucks. I love Omerica but they are pretty pricey. My favorites I have from them are my owl plugs I got from my boyfriend for Christmas. 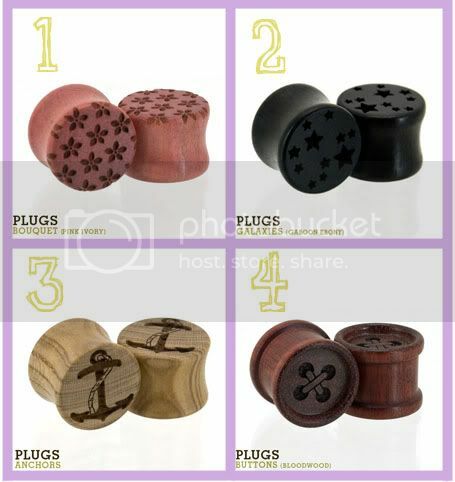 If I just want plain wooden plugs I get them from Onetribe. They are pretty cheap and you get free shipping too! I stuggle to find pretty plugs...well any plugs over 1.4 inches in the UK. FAIL! OMG this is amazing! I just bought 2 pairs! thanks for sharing your lovely Finds!!! all the designs look so cute! I don't have plugs but I like them on other people. So me and my friend have been interested in doing this to our ears. How do you do it or how does a pro do it? I'm wearing those plugs RIGHT NOW! Yay! I love their plugs, I looked at some the other day and was totally in love. They had little octopi ones, and mustache ones! So cute. Whenever I have the spare money, I will totally be grabbing myself a pair! I love Omerica's designs. I'm a new organic plug maker and I get so inspired by them! I love love love the inlay work and multi-wood pieces...beautiful! I would go for the buttons! I am DYING for the keyhole Omerica ones,& the puzzle ones as well.Haven't tried Omerica yet,actually,haven't tried any double flares yet,but I want to.The piercing place I go to carries some Omerica,so I may buy my 1st pair there;being that I'm at only 1/2",I'm always afraid the design won't really show as well,so I want to see them in person first.